In the bowl of a stand mixer, combine yeast, salt, eggs, honey and melted butter. Mix in the flour and don't knead. Use the dough hook attachment and mix for about 5 minutes, or until dough begins to pull away from the sides. Pour dough in a large, lightly greased bowl, cover and let sit until doubled in bulk, about 2 hours. Place risen dough in the refrigerator overnight. The next morning, roll out the refrigerated dough into a rectangle with about 1/2-inch thickness on a lightly floured surface. Using a bench scraper or pizza cutter, cut the dough into 2-inch squares. Let dough rest for about 15 minutes. Meanwhile, heat a medium saucepan with vegetable oil 3 inches deep until the temperature is at about 360°F to 370°F (this is VERY important, as the beignets will burn or be too greasy if the temperature is higher or lower than indicated. A candy thermometer works best for measuring the temperature). Using a slotted spoon, lower pieces of dough, about 2 at a time in the oil bath, and let sit for about two minutes on one side, one minute on the other (they might sink at first but should rise to the top eventually). 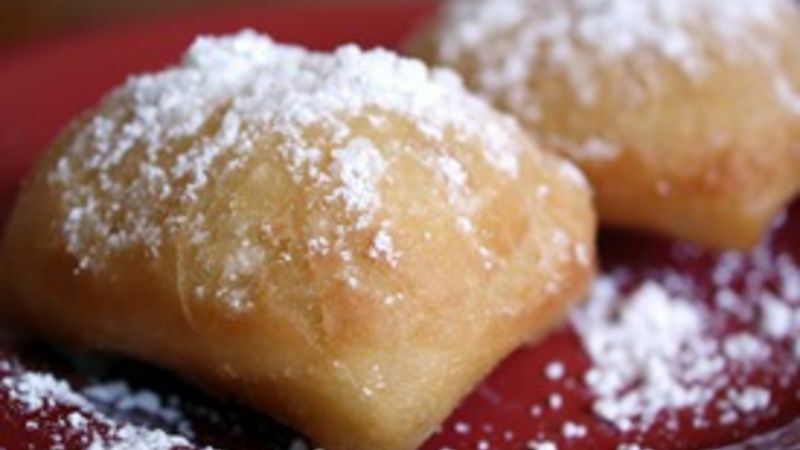 Remove beignets from the oil with the slotted spoon and place on paper towels to dry. Immediately dust with powdered sugar and serve warm. Let's be honest here: Who doesn't love a good doughnut? It's hard to deny that deep-fried goodness laden in glaze, topped with frosting and sprinkles or stuffed with jelly or cream. Some are long and rectangular; some are circles with holes in the middle; and some are just doughnut holes. And some are French. While I have had the fortune of visiting France, specifically, Paris, I regret to inform you that not once on my trip did I have a beignet (the French term for "fried dough," or as we lovingly call them, doughnuts). I had Croque Monsieur, I had chocolate mousse, I had the best veal I'll ever eat in my life, I'm sure, but no beignets. So I ventured to change that. Having never made anything doughnut-related before, I was a little nervous to try the whole "oil bath" thing. I've heard horror stories of spattering grease burns and frying all available dough to a crisp, so I admit I was a tad apprehensive to go down this road. Still, it was an adventure I committed to, and there was no going back. The dough itself is wonderful to work with -- super easy to make, and almost exactly like Brioche, with that fluffy texture and ever-so-slightly sweet taste. Though there is some patience involved with time (it's best to let the dough refrigerate overnight to develop it and to make it easier to work with), it's worth it. What's not so wonderful about this process is the frying. If you have a deep fryer lying around, good for you. Use that to your advantage. I don't, so I went the traditional oil-in-the-saucepan route and used a candy thermometer to gauge that precarious temperature. (Note: It MUST be between 350 and 370 degrees F, or you will have either burned beignets or greasy, floppy beignets. I know this firsthand.) After a few hits and misses, I finally was able to make several successful fried dough fritters. These tricky little things should also be dusted in powdered sugar fairly immediately, as well as eaten fairly immediately. They don't want to waste their time, or yours. Though it was a bit of an adventure to make beignets, I'm glad I did. And I wouldn't mind having them again -- in Paris.